Isuzu is one of those Japanese car manufacturers that stay in their comfort zone by doing what they do best, which is producing quality pickup trucks, sports utility vehicles, and commercial trucks. One of its shinning stars in the SUV category is the Rodeo. The Rodeo made its first appearance in 1990 as a smaller less expensive Trooper type SUV. 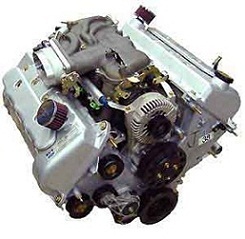 Usedenginessale.com has Replacement Used Isuzu Rodeo Engines for Sale less than you expect, call now. The Rodeo was specifically designed for the US market. It was constantly updated from a performance perspective. The Rodeo was assembled in Indiana by Isuzu and Subaru. When the first Rodeo was introduced it had a 2.6 liter, 4-cylinder engine that was rated with 120 horsepower. A 3.1 liter V6 made by GM was also available with an automatic transmission. The early Rodeo engines got decent gas mileage. The 2.6 liter got 18 mpg city, and 22 mpg highway. The 3.1 liter 4-wheel drive engine got 15 mpg city, and 18 mpg highway. In 1993, a 3.2 liter, 4-cylinder V6 was under the hood, and a Family II 4-cylinder from Holden was also available. In 1996, Isuzu cranked the horsepower up on the 3.2 liter to 195 hp with 193 ft-lbs of torque. The second generation Rodeo got a boost when the 4-cylinder was dropped, and a 3.5 liter V6 with Direct Gasoline Injection became an engine option. That engine was rated with 250 horsepower and 246 ft-lbs of torque. In 1998, Isuzu and General Motors form a company to manufacture diesel engines. The small Amigo made a comeback using the same sheet metal as the Rodeo, but it had a shorter wheelbase and stiffer frame. The Amigo was a shorter soft-top, 2-door version of the Rodeo with a 2.2 liter 4-cylinder engine. In 2002, the Amigo became the Rodeo Sport to compliment the longer Rodeo style. The Rodeo Sport was discontinued in 2003, and the Rodeo was dropped in 2004. The Rodeo was forever immortalized by Collin Raye in 1997 when the song “Little Red Rodeo” became popular. The song told the story of a man trying to find his girlfriend who drove a red Rodeo. The Rodeo also known as the Isuzu MU Wizard has a special place in the hearts of frugal SUV owners because the engines produced great gas mileage, and a comfortable ride while hauling weekend loads to the dump. For the best and most thoroughly checked pre owned/used engines call Usedenginessale.com. Every used engine is tesed in the donor car for performance and oil leaks before it is certified. Call now for our everyday, no gimmick low prices.